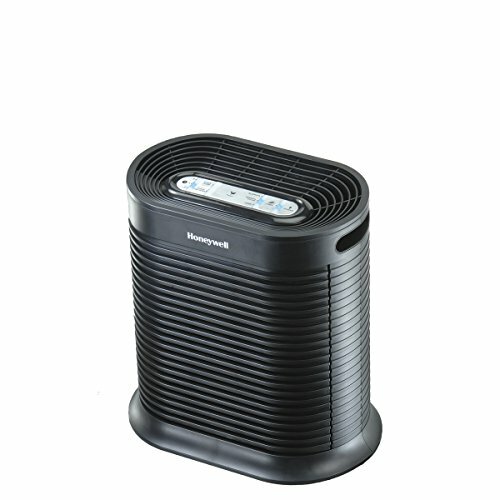 HEPA AIR PURIFIER FROM HONEYWELL: Recommended for medium rooms (155 sq. ft.), this air purifier helps capture up to 99.97% of airborne particles as small as 0.3 micron, like pet dander, pollen, dust, mold & smoke. Also helps capture certain germs & odors. REDUCE ALLERGENS: Do you or your kids have allergies? Do you have pets, or live with a smoker? Using an air purifier that helps remove allergens from the air let's you breathe easy, and enjoy sleeping & relaxing more comfortably in your home. HONEYWELL QUALITY: Improve your air quality with Honeywell air cleaners, odor reducers, and air purifiers. Compare to similar products from Germ Guardian, Dyson, Holmes, Levoit, Molekule, Blueair, Winix, Coway, Oreck, AirMega, RabbitAir, and Rowenta.